So I’ve loved horses since I was a kid. I rode as often as I could when I was younger and owned a Quarter Horse for a little while before we moved to the city. When I started my Life List, I realized how much I missed it. This past May, after about a decade away from horses, I found a barn near my house & a lovely lady who gave me a few lessons because it’d been so long. Much to my surprise and delight, riding a horse is like riding a bike. It pretty much came right back. I’ve been riding regularly ever since. According to the Journal of the American Medical Association, riding horses has been shown to ease symptoms of anxiety, depression, stress, and the like. Horses are herd animals. Because of that, they are incredibly intuitive and empathetic about the animals around them. That includes the humans around them. They read and react to your body language & emotions. Horses can act as a mirror to you and show you how you are in the world. According to neurological studies, people’s brainwave patterns change when they are near horses. People calm down. They are better able to center themselves and focus. Working with horses will help you overcome fear (if you’re afraid of large animals) & increase your self-confidence. You’ll learn patience, too. Those skills will help you in many areas of your life. If you ride the same horse repeatedly, you’ll develop a connection to that animal that includes building trust and creating a friendship. Like any relationship, you’ll learn things about the horse’s personality & you’ll learn things about your own, too. 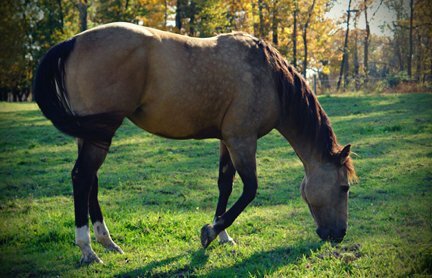 4 Responses to "One Wild Life ~ Ride Horses Regularly"
I love horses, but I have yet to ride one. I foresee it happening real soon though. There’s a stable here in the mountain community where we have lived for a little over a year now. I have been meaning to do some more volunteering there for quite sometime, but my scheldule hasn’t permitted me to do so. I think I may head over there today for an hour or so. You have inspired me to stop procrastinating and putting it off. I did some volunteer work there back in Spring during the Youth Fest. So, there are a few horses I am sure remember me from then. It was so rewarding to see how both – the kids and the horses – interacted with one another. I hope my first experience riding is just as rewarding as theirs seemed to have been. Thanks for sharing your knowledge on the subject with us. It’s always a pleasure reading you. Cheers and Blessings. Lovely to see you. I’m so glad that you’re going to start riding. It will change your life for the better. 🙂 Thanks for the fab compliment. Made me smile today. Cheers & blessings right back, my friend. Your points about horses in general and the benefits of being around and riding horses are spot on. All of the points you’ve given are reasons horses are used in therapy for people with severe disabilities. I have done volunteer work in a therapeutic riding program and can attest to its effectiveness. These programs are used to help disabled Vets, specifically those with PTSD. I glad you’ve had the chance to reconnect and develop a bond with a horse. Lovely to see you here this afternoon. I’ve heard of equine therapy doing amazing things for people with both mental & physical disabilities. I’m so glad to hear that more & more riding programs are being developed, especially for disabled Vets. I’m glad that I started riding again, too. 🙂 Have a great week. Cheers, my friend.